Road maps are a joy to collect and in most instances very inexpensive. There are thousands of different road maps to collect. One can try to collect from certain decades or time periods or different types. Some collectors concentrate on road maps that were issued by oil companies through their gas stations or maps that were issued by each state, province or local community. Maps were also issued by tire companies to bring in customers. The range is unlimited and for the collector a guarantee that each visit to a yard sale or flea market will turn up an item not in the collection. Road maps have been issued and distributed for special events; such as the 1933 Century of Progress in Chicago or the 1939 New York World's Fair and even for the Canadian Expo of Montreal. Maps have been seen as a valuable tool to find one's place on the road to reach a certain destination and companies hit upon a wonderful item to advertise their products and services. Over the years ads have been run in national magazines advertising road information and even encouraging consumers to write to the company and tell them where you live so that the most direct route to your destination could be plotted. This devise has been employed for the Century of Progress and New York World's Fair and even by White Rose Oil Company of Canada for Expo. White Rose ran ads in Maclean's magazine. Unfortunately today, maps come with a price even at gas stations. In the old days in fact into the early 70's oil companies had racks of maps inside the station and gladly let an individual take what they wanted. I can remember customers coming into my father's Phillips 66 gas station in New Jersey in the 60's spinning the rack and taking the map that was of interest to them. I even saved some for myself. Companies were happy to "eat" the cost for the map--it was an advertisement for not only their gasoline, but oil, tires and other services. Companies actually attempted to have the best, most interesting maps each year to encourage repeat customers. Also maps were upgraded to show new roads or problem areas. Companies wanted to ensure that the customer was well informed and therefore would return. It was a cheap marketing tool. But, how did the road map become such an item and collectible? Well, we tend to think of today's car and road system and never really think of what it was like at the start of the 20th Century. Cars were starting to become popular, but roads to say the least were not in very good condition. Out in one's care there were no road signs, so one had to stop every few miles to ask someone for directions. Must be where the famous term, "Just up the road a piece - you cannot miss it" came from. The only real road maps were from the 1890's. These maps had been prepared by local bicycle clubs to give cyclists information on the local road conditions (grades, material of the road surface, curves, hills). And old bicycle maps from this time period are very collectible. By 1915 more cars were appearing on the roads and oil companies were expanding their network of gas stations to serve the driving public. Led by Gulf Oil the first road maps appeared at the gas stations and were being given out. Today the number of gas stations companies is small in number compared to the early years of driving. Companies required not just customers, but repeat customers to make their oil companies grow and expand. Tobacco companies faced the same situation at the turn of the 20th Century how did one company set itself apart from the others. "Branding" - make the public remember your name and logo. For tobacco companies it was putting picture cards with advertising in the packs. For oil companies, tire companies and others road maps were that perfect vehicle to achieve that goal. Tire companies were next to move into the area and then eventually road maps were being employed as a marketing tool by local communities, cities, Chambers of Commerce. Each saw it logically as a perfect tool to bring dollars into the community. Maps became colorful as well as informative. Maps put into circulation at this time by the Automobile Club of Southern California are sought as collectibles. At the time the road map brought in tourists and then many of the tourists loved the area and warm climate so much they became residents. The movie industry moved to Southern California for the sun and warmth. The sun was important to the financial bottom line, movies could be made outside and costs reduced as the natural environment could be employed rather than a large building. Anyone traveling to Southern California today should just look at the Freeways and realize what a recent development the system is. With the end of World War I and Henry Ford's use of the Assembly Line - the automobile become very affordable to almost everyone. Remember that one of the key ideas of Henry Ford was to pay his workers well enough so that each could afford to purchase the automobile that was being manufactured. He understood that to make money for himself he had to grow the market and encompass more buyers. The first official state highway maps appeared in the mid 1920's. Each was pocket sized issued by the new state highway departments. The pocket sized folded maps showed state and country roads and in some instances even described the road surface. The Official Map for the State of wisconsin listed various road surfaces; gravel, clay, and sandy. This information assisted the driving public to know that on rainy days clay roads would become very slippery and to be careful. Needless to state what bad rainy weather meant for sandy roads. These first state maps usually measure 24 1/2" x 21". Of course along with the maps and the increase in autos, each state began to realize that there were funds to be gained from issuing license plates, drivers licenses and of course eventually tax on gasoline and other products. Roads would need to be expanded and repaired and who should be required to pay. Of course this debate continues today. The Goodrich Tire Company began to give out maps shortly before 1920. The first maps were primitive - just as the roads and information was at the time. The first maps had lines from town to town which indicated one could go - from here to there, but did not explain how. As the years progressed tire company maps came to rival oil company maps for their beautiful artwork. The 1930 Goodyear map is in three colorful panels. It folds out to reveal a tire on one panel, information on the other end panel and in the centre a city in the distance. Cars coming and going from the city. The other beautiful feature is a Goodyear Zeppelin or Blimp flying over the city in a night time scene. A very collectible item..
About 1927 maps underwent a change. A standard national highway numbering system was brought in and this resulted in the hundreds of oil companies to advertise by having Highway names on the maps. The famous Highway or Route 1 which went past my house in New Jersey. Other maps were keyed into the Oregon Trail, Yellowstone Trail, Tobacco Trail, Dixie Highway. Names to make the driver and passengers feel as if they were in a covered wagon making the trek to an exciting destination. All part of the marketing agenda. Some of the more expensive maps that are interesting to collect are from long gone oil companies such as the Gilmore Oil Company of California, Washington and Oregon from the 1930's. Featured was a Red Lion logo. The Red Lion was also employed to advertise for the companies traveling circus which visited all the company gas stations twice a season. Maps of states are usually more popular to collectors than city maps. This is even though city maps are usually in shorter supply. Maps that feature states that had small populations in the 1920's and therefore few roads are sought by collectors. Florida, California, Texas are major population areas now with thousands of roadways, but in the 1920's were small population states. By 1970 the Interstate Highway System had made driving less interesting. The major Interstate Highway System that was built in the 1950's under President Eisenhower is officially the Defence Highway System. It was built during the height of the Cold War to move military equipment rapidly in time of crisis. In addition by the 1970's the thousands of oil companies had disappeared down to a few and the companies did not see the need to advertise as in the past. Road maps were perceived as just another cost to a companies "Bottom Line". The concept that it brought in customers had been forgotten. The long era of getting something for "free" from a gas station had gone the way of "free air" for a car's tires. 1. In 1932 - 33 Shell issued maps with state license plates. One featured a woman in a open convertible with a terrier dog. At the top of the map is the name of the state that it covers. The license plates of every state appear along with the Shell logo in the corner. The Shell maps had bright, strong yellow, red and blue colors. A second version of the map has a man and woman in a convertible with the woman's scarf flying in the breeze. 2. 1929 Shell map. Easy to date since top of the map has 1929. Features a Shell gas station in the centre of the map. On the rest of the map appear 5 cars, a wooden speed boast racing across the water and a aircraft flying overhead. One car is parked at the Shell station waiting to be filled with gasoline and have the oil checked. A bright mult-coloured map and very rare. 3. 1939 State of Illinois Road Map. Plain colour, but has issued by the "Division of Highways" - "for Free Distribution". The front of the map features a bust of Abe Lincoln. Henry Horn - Governor. State maps became political literature for the governor and other administrators. Later a picture of the governor would usually appear - so one could remember the name and face. 4. 1920's CONOGO - "Compliments of Continental Oil Company. 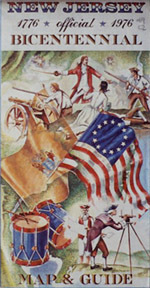 The map featured a Continental Soldier who was a symbol of the company. 5. 1938- Map issued by the New Mexico Highway Commission. "Free Distribution". A couple standing next to new red car . Woman with a wide brim hat, man with a summer hat. In the background is a Mission Church - Brother in a brown robe with a little child. In the distance a Native American. Just atypical Southwestern scene. 6. 1950's New Jersey Turnpike Glass Roadmap. Sold at the restaurant - gas stations on the Turnpike. 6 1/2" tall drinking glass with a map of the entire New Jersey Turnpike etched into the glass. Each exit is even marked in bright Orange colour. Slogan on the glass states: "118 Miles of Effortless Driving". Blue and orange colours. My house in New Brunswick, New Jersey was right across from the NJ Turnpike and Exit 9. 7. Shell map issued for Expo 67 in Montreal, Quebec. Dates are listed on the map - April 28th - October 27th, 1967. Map is 6 1/2" x 3 1/2". Multi-coloured with some displays of exhibits on the front of the map. Map is bi-lingual and is small enough to be carried in a pocket. 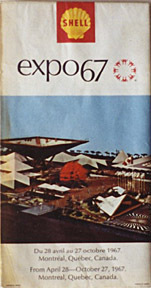 Extra added feature is a map of the Expo site inside. 8. Texaco - New York - "Host State for the World's Fair (1964-1965). Front has multi-coloured painted scene of the sights of the Fair. At the bottom is, "Trust Your Car to the Man who Wears the Star". A Texaco Red Star and Green T appear on the map - company logo. The back of the map is an advertisement for "See the World's Largest Road Map" featured attraction giant Texaco road map of New York State - "You Can Walk Over the Terrazzo Map". The map is half the size of an American football field. An ad inside encourages one to apply for a Texaco Credit Card. 9. Northern Ontario - Centennial Issue - 1867- 1967. Department of Highways, Ontario. Painted front features a trapper looking down at the modern highway. Mountains and scenery. Back of the map lists newspapers, radio and police services in the area. 10" x 4 1/2". 10. Eaton's of Canada - City map of Montreal, Quebec - 1950's. "Eaton's of Canada - Welcomes You to Montreal - Canada's Largest Retail Organization". Front is a picture from the top of Mount Royal looking down at the city and St. Lawrence. "Eaton's - Montreal's Favorite Shopping Centre is located in the heart of the shopping, hotel and theatre district". Back is in French. Inside of the map has a directory of the main Eaton store downtown. All the floors listed and what is featured. Main Floor - Irish Lines, 3rd Floor - Furs, 4th 1 Floor - English China. Map also shows locations of the 250 Eaton stores across Canada. 11. 1970's map by Gulf Oil. Map starts in Michigan and takes the route to the new Disney World in Florida. The entire trip is taken on Highway 75. Front of the map features Gulf - "Stop at the Sign of the Orange Disc". Back - "Gulf is the official supplier of petroleum products at Walt Disney World and the Gulf automotive care Center located at Walt Disney World Drive". Front features a painting of the Magic Kingdom. 12. The Milepost - Alaska and Yukon Travel Guide - All Routes by land, sea and air. Large map booklet which lists the extensive maps of the area and outback areas. Mile by mile logs of the hotels, motels, lodges and special services including hunting and fishing for the traveler or camper. Cities and villages and natural wonders are listed: "All You Want To Know". 1961 edition. My father-in-Law and mother-in-law were married in 1940 and traveled out to Yellowstone on some of the items mentioned. They even heated their supper on the radiator of the car. The maps from the 1920's - 30's command the highest prices usually. It is seen as the Golden Age of Gasoline Road Maps. The other factor is that millions of the maps were destroyed in paper drives of World War II. Also the artwork in the early maps was outstanding and the majority of the oil companies giving out the maps disappeared shortly after the end of World War II. Collect maps that are close to mint condition. Beware of stains, bug holes or maps that are torn and worn on the edges. Of course if it a rare map one has to determine whether in less than mint condition is a chance to be taken since it may not be found again.